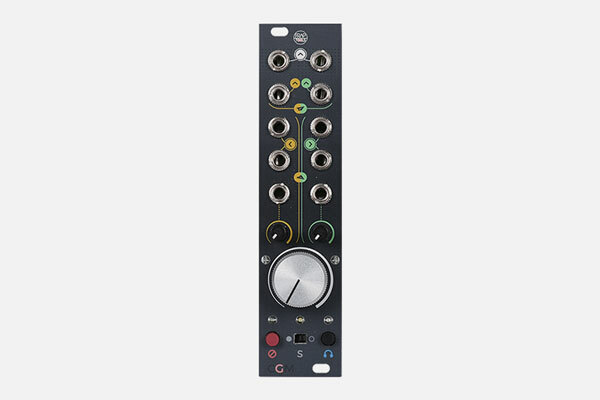 The CGM Group module, gets and sums the L/R post fader signals (WHITE) of all the connected Channel modules, sums all the signals from the YELLOW and GREEN sends, and manages the sends (mono) and returns (DUAL MONO or STEREO), summing it to the signals from the CHANNELS. It also manages the solo in place activation on all the linked Channels, and provides a L/R output for the outgoing signal, or (via a jumper on the back of the module) a L/R output of the sum of the returns signals. Up to 8 Channels may be connected to a single Group, taking care also of its powering.